As we mentioned at the top of the review, the Gigabyte GA-X79-UD5 motherboard comes with a nifty PCI Express x1 expansion card that supports Bluetooth 4.0 (Smart Ready) and 802.11b/g/n Wi-Fi connectivity standards. The idea is that with the increasing number of smart phones in use nowadays, users want to augment the keyboard and mouse with a mobile device. This infrastructure allows a tablet or smart phone to leverage apps such as Splashtop and VLC Remote (iPhone, Android, Web OS, iPad) to manage content on a desktop in a sort of cloud-type-environment, or even simply permit easier data syncing between devices. Gigabyte GC-WIFI Bluetooth 4.0 and 802.11b/g/n PCI Express x1 bundle-in card. 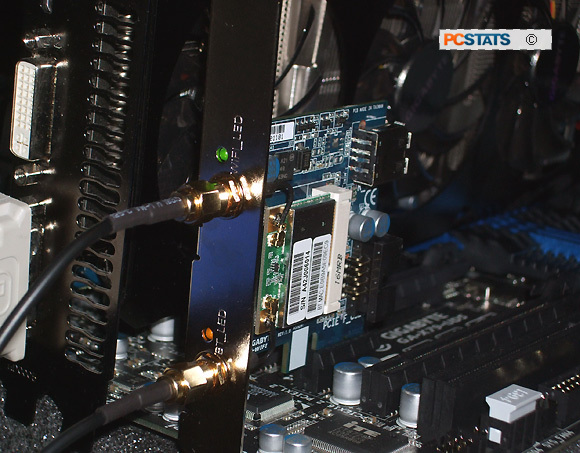 The Gigabyte GC-WIFI card installs into either of the GA-X79-UD5's two PCI Express x1 slots and a USB jumper is connected to one of the boards standard USB 2.0 headers. 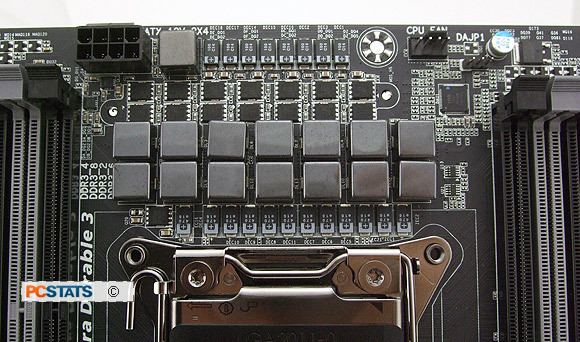 It's best to leave the red-marked USB 2.0 header for a front panel USB bracket since this port supports rechargeable USB devices when the computer is powered off. Gigabyte 'On/Off Charge' USB ports are useful for charging up an iPad or iPhone. The Bluetooth 4.0 device connects to the PC via the two-port USB jumper cable, so a single internal USB 2.0 port is offered on the card too. 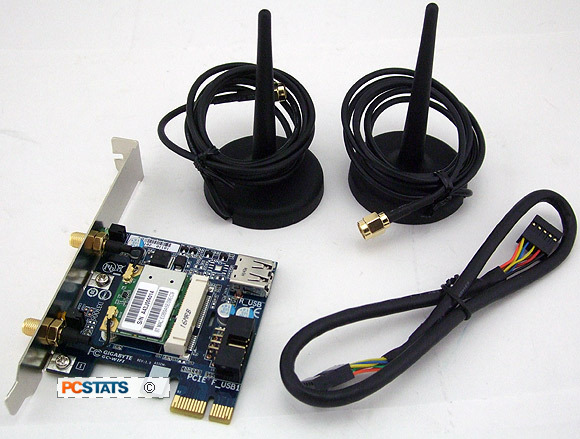 The 802.11b/g/n wireless card uses the higher bandwidth PCI Express x1 interface for data transmission. One antenna is for Bluetooth 4.0. The other antenna is for 802.11b/g/n wireless. On the supplied driver CD Gigabyte include a small utility called 'CloudStation' which help apps to communicate and share resources on the PC. Care of PassMark's Network Speed Graph, here's a quick results set for the Gigabyte GC-WIFI 802.11b/g/n card in terms of speed and throughput. If you recall, 802.11n is rated to a maximum speed of 300 Mbps (100-150Mbps average throughput) and operates on a 2.4GHz signal to give it a theoretical indoor range of ~70m. The first chart is UDP, second chart is TCP results. Over UDP, average transmission is 48.77 Mbits/second. Over TCP, average transmission is 41.33 Mbits/second. The Gigabyte GA-X79-UD5 test system draws 90W while idle at the desktop. Under 100% CPU load conditions with Prime95, total system power draw jumps to 207 Watts. 3DMark06 pushes power draw to a peak of 280W.